The Meaningful Life of Manophet – Patrick F. Clarkin, Ph.D.
Manophet Lonebuffalo was an amiable, kind-hearted man who lived in the small town of Phonsavanh in northeastern Laos. His primary job entailed working for the Japanese Mine Action Service, a nonprofit organization that helps to clear unexploded ordnance in Laos, among other places. But that was only one of many activities that occupied his time. He was also a tour guide for foreigners, a teacher of English, a football coach and referee, and a single father of three boys, at least one of whom was Hmong and adopted. I was very sad to learn recently that he had passed away of a stroke, quite prematurely, in his early 40’s – a good person’s life cut far too short. I met Manophet in July of 2009, through mutual friends who suggested that he would be a good person to show me around Xieng Khouang province, a place I had only known previously via books and vicariously through my Lao and Hmong friends in the U.S. and French Guiana. Though I only knew Manophet for a few days, I am grateful for our brief encounter. It was immediately apparent that he was a person respected in his community. As I got off the plane from Vientiane in Phonsavanh, I could see that he was greeted by many other locals who were also on the flight, including a petite, elderly woman who put in a good word for me for helping to carry her bags. It was a good start to our meeting, though my tiny good deed paled in comparison to Manophet’s accomplishments. I quickly learned that his home doubled as a school, where he gave private English lessons to hundreds of children and adolescents eager to learn, for a nominal fee or for nothing at all, if circumstances warranted it. He asked me to be a guest teacher, but I found myself struggling to answer the students’ questions about what music was popular in the U.S. After asking the class if they were bored with my English lessons and ignorance of American pop culture (answer: ‘yes!’), I switched over to human evolution and the story of our species (a universal hit, even in Laos). I consider myself a decent teacher, but was humbled by the experience. Manophet smiled, however, and thanked me for trying, as students trickled out his front door while saying goodnight to him, their respected teacher. When he wasn’t teaching or working for JMAS, he coached boys in football in the field directly in front of his home. 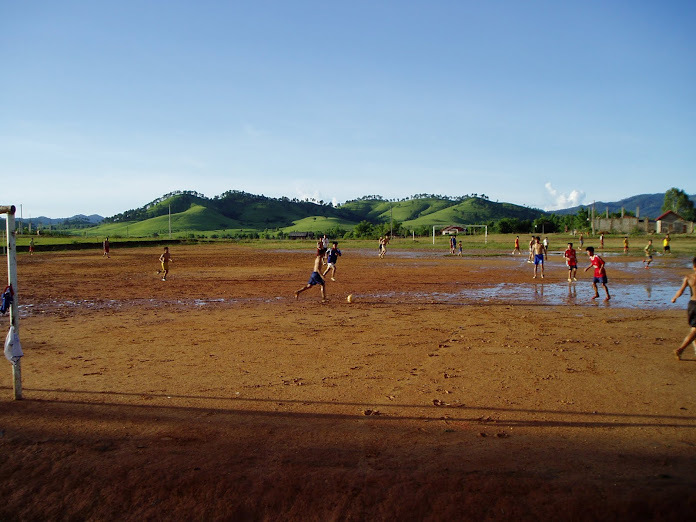 The evening I visited him, the field was surrounded by people watching or waiting to play, their enthusiasm undampened by the muddy, rain-soaked field. As we watched the game, with Manophet acting as coach/referee, a Hmong teenaged boy struck up a conversation with me to practice his English before classes began. It was clear that he had learned a lot from his teacher. In the day, Manophet brought me to a field site in rural Xieng Khouang, where we met a UXO Lao team detecting and clearing bombs that were dropped decades ago by US planes. He explained the process and the role of the different team members, as we discussed the impact of the war and the heroism of the people whose job was to help rid this scourge that plagued so much of the landscape of Laos. I couldn’t help but notice the juxtaposition of the idyllic, physical beauty of the area with the heartless machinery of war. I think Tolkien would have appreciated it. 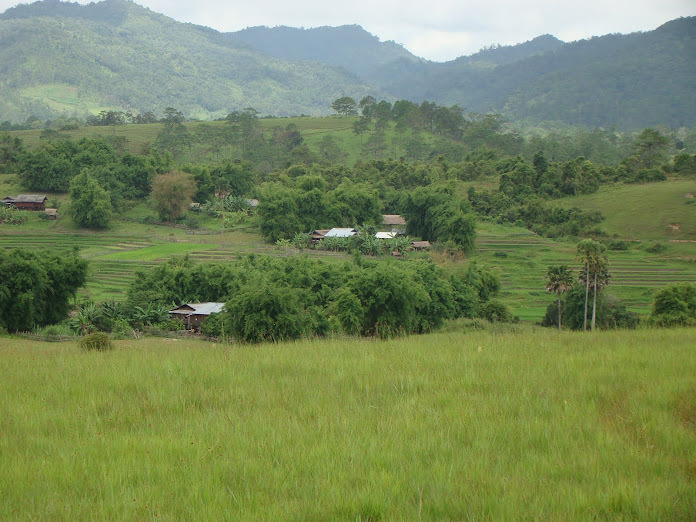 If there is a heaven, I imagine that it would look like northern Laos, only without the bombs. Manophet arranged it so that I could detonate one of the bombs the team had detected that morning, after lying there, dormant, for at least 36 years. It was an experience I will remember for the rest of my life, though I could not help but feel some shame that the mess these men were cleaning up was left behind by my country, more than three decades after the war had officially ended. 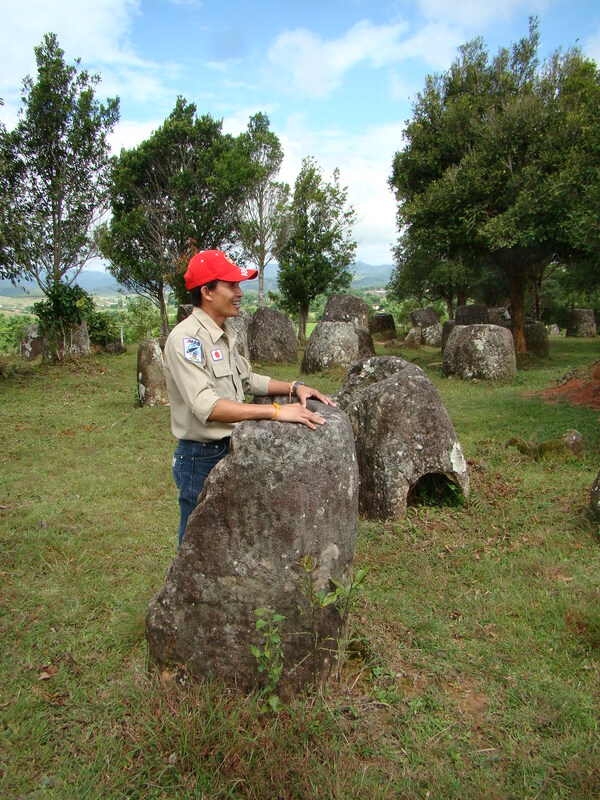 We were also able to see many other places, including the Plain of Jars, the cave at Tam Phiu, and the town of Muang Khoun, where I met Manophet’s mother. She had lunch prepared for us, and at the end of our stay she blessed me and tied some bai sii strings around my wrist, wishing me well before my journey home. Through Manophet, I told her that I would remember her. I wonder now if she survived her son, and I think of how she kept him alive during the war when he was a small child. In a cave near the Plain of Jars, Manophet told me the story of what happened to his family during the war. In 1968, a bomb landed near their home, setting it on fire, and forcing the household members to exit through either side of the house. In the chaos, they became separated. One brother, he later discovered, became lost completely and was presumed dead. Manophet found himself traveling with his mother and older sister as they searched for shelter, and they walked for some time, with little to eat along the way. Manophet told me that he was too young for the journey and that he complained so constantly that his sister contemplated killing him, to avoid being detected by the noise he was making. Eventually, they found shelter in a cave, much like the one where he told me his story. Manophet: “…and we thought, if (my brother is) alive, he’s probably with mother, and my mother thought, if he was alive he was probably with father. When both sides came back without him, we thought he was killed. I can remember the inflection in his voice as he told me about how he lived in a cave for years during the war to survive the bombs that were mercilessly dropped around his family, as they subsisted on whatever meager food they could find. Particularly vivid is when he described being reunified with his brother in Laos after twenty nine years. It still makes my eyes well up. I can’t help but wonder whether the stresses Manophet experienced early in his life during the war were somehow connected to his premature passing. It’s impossible to know, of course, but there is a wide range of epidemiological literature that suggests the correlation is entirely feasible. Despite the tragedies in his life, he made the most of his time while he was here, helping others whenever possible and with a smile on his face. The world needs more people like him. This entry was posted in Laos and tagged Manophet. Bookmark the permalink. Yes Patrick, the world needs more like him. Fortunately it has at least 6.4 million, most of whom are like him — that’s the latest take on the likely population of Laos, be they ethnic Lao, Khmou, Hmong , Mien, Akha, Laven….and on and on. I still live in Laos but so many of the Lao of all ethnicities I knew are dead — but not killed by each other. 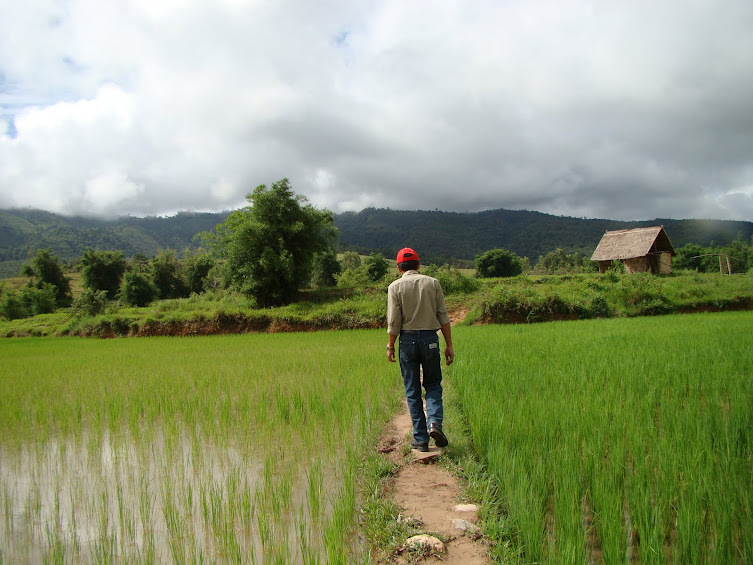 The latest (CIA) revision of life expectancy in Laos went from 58 last year to 61 this year. Never mind how 3 years more were obtained in one year. It’s still a long way from Cuba’s equivalent figure of 78 years. Socialism has a long way to go in Laos. But all is comparative and for families and individuals to live side by side, with no taboos on intermarriage or interaction is a lesson to the world. Many, yes MANY Hmong were born to ethnic Lao parents and vice-versa. One prime example is the owner of the famous Khop Chai Deu restaurant on Fountain Square, whose (ethnic Lao) mother died when he was 13 and he moved in with the neighbours and became Hmong. He went with them into the Lao Issara, continued on through the decades and party name changes and was in the caves with the heroes of the Revolution. When he came into Vientiane on ‘victory’ he was placed as number 2 in the Ministry of Information and Culture and continued his work trying to build socialism with no pay, growing vegetables in the Ministry ‘garden’ (car park) and getting a ration of rice each month. Then in 1979 he was told he had to go for re-education. He did 3 years and describes it as not making much difference in material terms — he still grew his own vegetables. He considered going to Thailand as so many had done but in spite of not understanding why he was in re-education after supporting the Party from the age of 13 and working side by side with Souphanavong (the red prince) and Kaysone, he could not bring himself to join the ‘enemy’. He came back to Vientiane and his old job. Retired, he was given as a ‘pension’ a broken down old French house of no value (now the most prosperous restaurant in town). He became the President of the Lao Writer’s Association and wrote ‘Sivit’ (Life) which puts it all down with no bitterness or hate — not even against America. He is one of very few Lao who have tried to write. They would be more, but since nobody reads there’s not much point in writing. He won the SEA Write Award for Sivit, but it’s available only in Lao (he does not speak English or French). When America was not involved in the war here but Congress passed billions for cultural aid to Laos, which perhaps had the biggest ‘US Aid’ presence in the world ever, some of that aid went to building a Pepsi-Cola factory. Nobody in Washington noticed that not one bottle of Pepsi left the gates until the Pathet Lao took control and dismantled the world’s largest heroin refinery inside. But the Pathet Lao never did close down Pepsi nor the US Embassy — or even that great icon of US Aid assistance — the KM3 bowling alley. Relations are now excellent between the USA and Laos and few would want them otherwise. The US has little direct investment here. There are a few small aid programmes run direct from the embassy — helping Akha grow tea and a bit of literacy promoting. Currently the US has started building a new embassy complex on the outskirts of Vientiane (budget unknown, rumoured well over one billion dollars). The US will keep its old embassy (its present one) in the epicentre of Vientiane and use it for ‘cultural purposes’. The incredible tolerance and friendship shown to America after the war is met by many in the US with scepticism. If only one billionth of the money the US spent on attempting to destroy Laos was used to translate a few stories like ‘Sivit’ for publication in English in the US, America might, if it cared to read, learn a lot. I very much like your memory — it matches that of many Americans welcomed in Laos. By the way ‘Phonsavan’ does translate ‘heaven’. Pingback: Manophet’s Team in Europe | Patrick F. Clarkin, Ph.D.
Pingback: Good Works in Laos | Patrick F. Clarkin, Ph.D. I met Manophet in 2003, during a tour through Laos. He also made quite an impression on me, partly by his unusual selection of “tour events” in Phonsavan (UXO Operations Centre; SOS UXO Orphanage; a visit with his mother; participation at his English school) and by his stories. I’m pretty sure he told me that he had been schooled in Russia for a period of time. He also told me that he had had malaria, and that his father had nursed him through a long convalescence. I liked him very much. When I returned to Canada, I sent a box of books to him (for his English school). He was a gentle and kind man – I’m happy to find your article on him. Hi Philip, I had the same impression that you did. He was a good person. If I recall, I think he said he had Russian instructors, but I think they were in Laos. My memory is fuzzy on this. Someone contacted me a while ago about Manophet, saying that he was working on a book about him (I don’t know how much progress has been made on this). He certainly touched the lives of many people and I think more people would like to read about him. My name’s Huyen, from Vietnam. I’m working at CIAT ASIA. Currently I’m updating some big projects on our website https://ciat.cgiar.org/ciat-projects. One of them is Xieng Khouang Province, Laos. I asked project leader to send me qualify pictures but I couldn’t choose one. I need a very nice picture for the cover thus i search on the internet and found your – the one with small house and terraces. This message is to ask for your permit to use that pic on our website. Of course, we will cite your name in the corner. Is it ok? Dear Huyen, Yes, you can use it. That is fine with me. Thank you for asking.